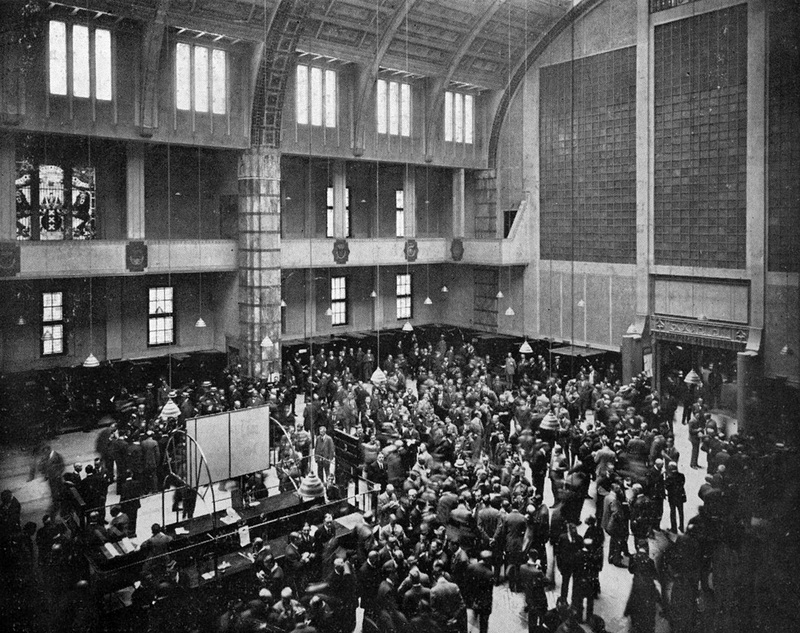 The trading floor at Beursplein 5, a few years after the start of trading in January 1914. With 1,350 square meters, securities traders had twice the space they had had in the Beurs van Berlage. 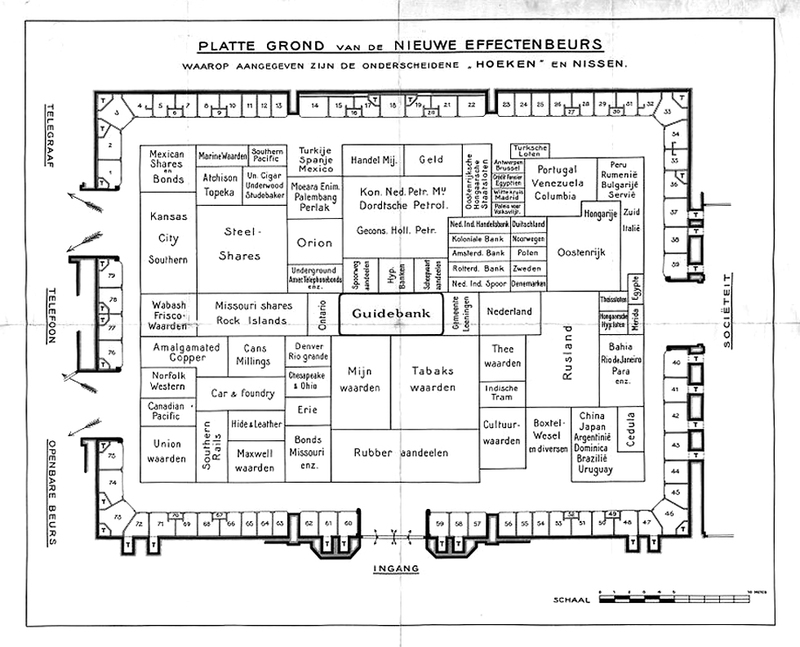 Floor plan of the new exchange at Beursplein 5, specifying the various ‘corners’ and exchange niches. A few prominent members had their own phones in their niches. Other members used a central telephone facility next to the floor. 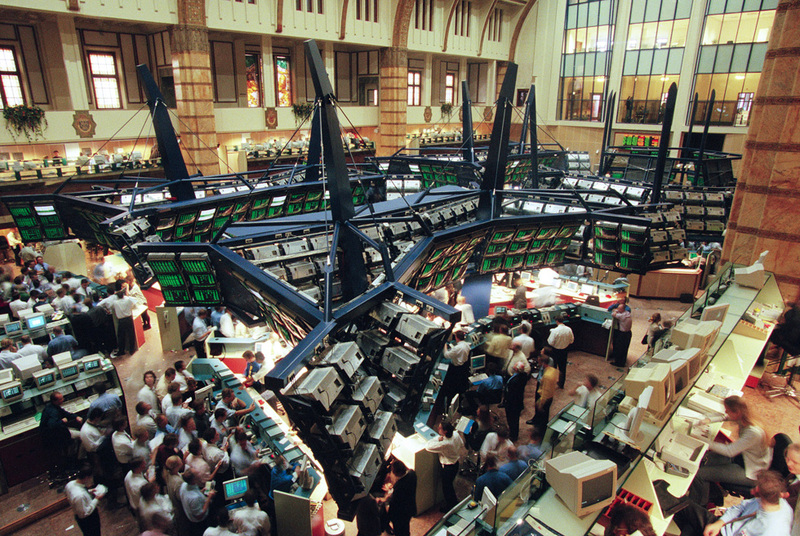 The exchange floor at Beursplein 5, the way it looked between 1998 and 2002, when options trading had taken the place of securities trading. The Vereniging voor de Effectenhandel (Amsterdam Stock Exchange Association) was dissatisfied with the securities floor in the Beurs van Berlage that traders had begun to use in 1903. Next to the Beurs van Berlage on Beursplein was the Bible Hotel, which stood on the edge of bankruptcy. According to the association, this was a good location for its own securities exchange. The hotel was demolished in 1911, and the official opening of the stock exchange on Beursplein 5 followed as early as December 22, 1913. Architect Jos. Th. J. Cuypers had previously made a name for himself with the design of the new Cathedral of Saint Bavo in Haarlem. For that building, he devised a very solid foundation, which was an important point of focus in the marshy city of Amsterdam, where previous exchange buildings had fallen victim to subsidence. In Cuypers’ design, the trading floor took up 1,350 sqm, which was twice as much as the securities traders had in the Beurs van Berlage. To finance the building, the association issued a bond – how else could it be? – of three million guilders at an interest rate of 4% among its members. The loan was oversubscribed as many as 18 times. The walkway that connected the Beurs van Berlage with the new stock exchange was remarkable. This walkway came out in the so-called Public Exchange (‘Openbare Beurs’), where securities auctions could be held. In practice, this rarely occurred, but this way, the requirement of the municipal authorities that trade had to be public and accessible to everyone, was met. The last few days of December 1913 were used to allow the public to get acquainted with the stock exchange building, but on January 2, 1914, trade actually began on Beursplein 5. After more than fifty years of striving and three centuries of ‘dwelling’ with commodity traders in the municipal Koopmansbeurzen (Merchants Exchanges), a long cherished wish of the Amsterdam securities traders had been fulfilled: their own stock exchange building as a basic condition for a healthy growth of securities trading. For eighty-five years, the main exchange floor on Beursplein 5 was the exclusive domain of securities traders. This changed in 1998 after a merger with the Options Exchange and full automation of securities trading. Options traders took over the floor for a short period of time, until they, too, definitively switched to screen trading by the end of 2002, Today, the floor is rented to resident traders, who participate in exchange trading from behind their computers.